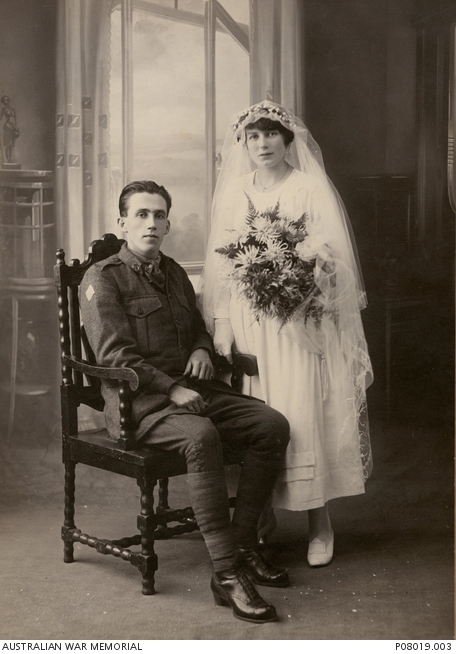 Studio wedding portrait of 5936 Private (Pte) Stanley Martin Anderson and Miss Lillian A Beechey. Pte Anderson, 20th Battalion, was a chauffeur prior to enlistment in July 1916. He embarked on board HMAS Ceramic (A40) on 7 October 1916 and served on the Western Front. Pte Anderson was wounded in action at Amiens, France, on 11 August 1918. He was invalided to the UK and returned to Australia in December 1918. Written on the back of the photograph is the following: “To Auntie Annie. With Best wishes from Lill & Stan. May 5th 1920”.